Nelson Lake Landing is nestled on the shores of beautiful Nelson Lake (“Totagatic Flowage”), just seven short miles from Hayward, Wisconsin. At our resort you will find year-round recreation at its best! Each cozy lakeside motel unit includes all the amenities (and more) you would expect in a resort cabin. Each unit has a fully-furnished kitchen, sleeping accommodations for one to six people, bathroom and private patio. During the summer months, enjoy our wonderful, private sandy swimming beach, along with first class fishing and boating on right outside your door. 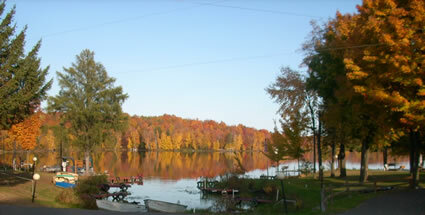 The resort grounds boasts horseshoe pits, a volleyball court, picnic area and children’s playground. Nelson Lake Landing caters to families!! There is a boat landing, gas and propane available, as well as a coin-op laundry. 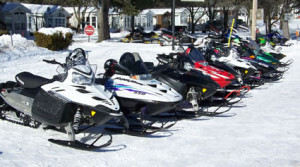 In the winter, the resort is open for snowmobiling – listed on the Sawyer County snowmobile map at location #122. Snowmobiling out of the resort, you have access to over 500 connected miles of groomed trails; while cross-country skiing, ice fishing or a quiet winter getaway can be enjoyed by others. Your vacation can be as busy or relaxing as you want it to be. 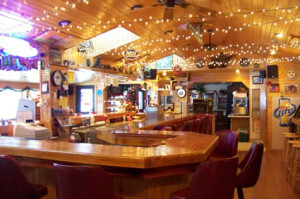 Our Tavern is a full-liquor bar is a friendly place to stop for a break and enjoy your favorite beverage and a meal. When you’re looking for the warm, good times, you’re sure to find them here at Nelson Lake Landing.